Morning shows, magazines, news outlets and online publications are always producing pieces dedicated to financial topics. We seem to have this insatiable appetite for money, yet most fail to understand how to achieve financial independence. In our introduction to financial independence, we break down the 5 key components of achieving what only less than 10% of people can. Less than 10% of people who reach retirement can claim they have achieved financial independence. At Bottrell Wealth we believe everyone can achieve financial independence by setting up a plan and sticking to their plan, for themselves and their family. 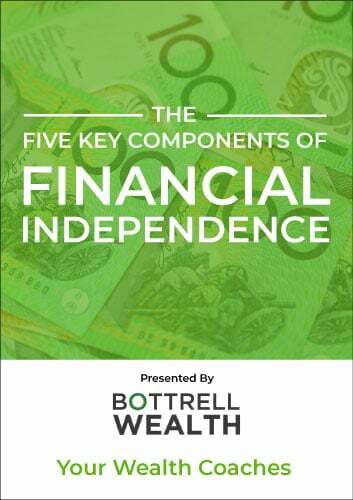 Wealth coaches, like the experienced team at Bottrell Wealth, are expert financial advisers and can save you hours of researching and assist you in implementing a plan to achieve financial independence. Bottrell Wealth have appointments available now. To speak with our accredited team, or to find out more about what Bottrell Wealth can assist you please click the button below to book a FREE consultation with one of our expert financial planners today.